7.1 The committee has received a range of allegations about the 2008 Bankwest commercial loan book and what caused a rate of loan failures that stood out from the rest of the banking industry. In this chapter the committee has collated those allegations and the responses from the Commonwealth Bank. This chapter also covers allegations in relation to the acquisition of Landmark by ANZ. While there are many sad and distressing stories now on the public record, the committee cannot help but observe that, in some cases, although the aggrieved borrower may have been able to operate successfully during periods when the business environment was relatively good, the more challenging times presented by the global financial crisis placed extra stress on less robust and more speculative projects. In many cases, loans were sought for ventures that were a considerable risk even during the more stable economic environment that existed prior to the global financial crisis; this is evidenced by the cases where banks other than Bankwest had refused to finance the initial loans. allegations regarding a deliberate strategy by the Commonwealth Bank to impair loans in order to seek financial benefit. 7.4 This section summarises the collapse of Bankwest's parent company HBOS and the banking strategies employed prior to the collapse of HBOS. The post-GFC Banking inquiry noted that Bankwest was dependent on its UK-based parent company HBOS for 35 per cent of its funding. HBOS, which was highly exposed during the GFC, experienced a run on its shares and was subsequently acquired by Lloyds. ...the downfall of HBOS was not the result of cultural contamination by investment banking. This was a traditional bank failure pure and simple. It was a case of a bank pursuing traditional banking activities and pursuing them badly...prudential supervisors cannot rely on financial markets to do their work for them. In the case of HBOS, neither shareholders nor ratings agencies exerted the effective pressure that might have acted as a constraint upon the flawed strategy of the bank. By the time financial markets were sufficiently concerned to act...financial stability was already threatened. In two markets alone—Australia and Ireland—it incurred impairments of £14.5 billion in the period from 2008 to 2011. These losses were the result of a wildly ambitious growth strategy, which led in turn to significantly worse asset quality than many of its competitors in the same markets. The losses incurred by HBOS in Ireland and Australia are striking, not only in absolute terms, but also in comparison with other banks...The repeated reference in evidence to us by former senior executives to the problems of the Irish economy suggests almost wilful blindness to the weaknesses of the portfolio flowing from their own strategy. 7.7 In 2003 Bankwest embarked on an aggressive growth strategy focused on the east coast states with the aim of opening 160 branches over four years. The ACCC described this expansion as 'unprecedented in Australian banking'. It was also reported that in 2007 Bankwest's lending increased by 36 percent. Some submitters advised the committee that Bankwest was the only bank that would consider their loan applications. 7.8 This section briefly summarises the role of the Commonwealth government in the acquisition of Bankwest by the Commonwealth Bank. Since July 2007, the global financial crisis has had an impact on the competitive dynamic in banking markets...the increased cost of wholesale funds since late 2007, many non-bank lenders who were reliant on wholesale markets for their funding have had to exit the Australian market. Other market players, including smaller authorised deposit-taking institutions (ADIs) with low deposit bases, have had to withdraw from lending in some areas or to some customers. The financial situation and risk appetite of HBOS (or a merged Lloyds/HBOS with 40% UK Government ownership) is such that these companies would no longer continue to grow the BankWest business. Not only would this likely see a cessation of the bank’s east coast expansion plan, but also the aggressive pricing targeted at growing market share. 7.11 On 5 December 2008 the Treasury received the Commonwealth Bank's application to acquire Bankwest under the Banking Act 1959, for approval under the Financial Sector (Shareholdings) Act 1998 (FSSA). When assessing the application, in addition to the above mentioned Public Competition Assessment by the ACCC, the Treasurer also considered the national interest under the FSSA. On 18 December 2008 the then Treasurer announced the approval of the Commonwealth Bank acquisition of Bankwest, making it subject to several conditions including the maintenance and growth of the Bankwest brand and branches. 7.12 As part of its response to the GFC, the Commonwealth government introduced a guarantee on retail deposits and a wholesale funding guarantee for ADIs. The retail deposit guarantee came into effect in October 2008 and applied to all ADIs, including foreign banks with operations in Australia. The wholesale funding guarantee came into effect on 28 November 2008 for eligible ADIs that registered for the scheme. However, for foreign bank branches, such as Bankwest, the guarantee only applied in respect of their short term wholesale funding raised from Australian residents with maturities up to the end of 2009. The average daily value of Bankwest securities covered by Commonwealth guarantee was first reported at $276 million in December 2008, peaking at $644 million in April 2009 and gradually reducing to zero by early 2011. Lloyds announced a proposal to acquire HBOS, with UK Government to take a 40 percent stake in the merged firm. Bankwest's intragroup funding estimated to be as high as $18b. Commonwealth Bank announces proposal to acquire Bankwest and St Andrew's for 0.8 times the book value, which is low compared to the nine precedents for which the average is 1.9 times book value. Commonwealth Bank entered into a Share Sale Deed with HBOS Australia and HBOS plc, which set an initial purchase price of $2.1b, with any amount owing by a Bankwest group company to the HBOS group to be paid in full by that Bankwest group company up to $14.5 billion on 19 December 2008, with any amounts in excess of this to be repaid on 19 June 2009. Australian government wholesale funding guarantee comes into effect, but Bankwest was not eligible. ACCC Public Competition Assessment decision formed the view that the proposed acquisition would be unlikely to result in a substantial lessening of competition in any of the relevant markets. Completion date, initial purchase price of $2.1b paid to HBOS, along with $14.5b for intragroup debt. By this date Bankwest had borrowed $3.751b from the Reserve Bank of Australia (excluding interest) and used these funds to repay a portion of its intragroup funding with HBOS prior to completion. Bankwest year end. Commonwealth Bank half-year end results indicate $328m for an initial estimate of the outcome of the price adjustment mechanism contained in the Share Sale Deed. Bankwest repaid the RBA funding amount of $3.77b (including interest) in January 2009 and increased its funding from Commonwealth Bank. Commonwealth Bank half-year and financial statements released, including disclosure of provisional acquisition accounting of Bankwest. Draft Completion Balance Sheet (DCBS) prepared for HBOS by KPMG for accounts as at 19 December 2008. This resulted in a proposed increase to the purchase price of $197m. PwC issues report to Commonwealth Bank based on DCBS on a range of disputed items, including the potential understatement of loan impairment provisions. Commonwealth Bank dispute notice sent to HBOS with 22 items disputed. Two of the items related to impairment of loans, with a combined value of $418m. Ernst & Young appointed as the independent expert to review the disputed items and determine the final purchase price. The excess funding amount between HBOS and Bankwest was determined to be $744m. In accordance with the Share Sale Deed, $744m was settled with HBOS, bringing the total funding repaid to $19.027b. Commonwealth Bank financial year end. Independent expert determination, final purchase price of $2.126b agreed being a net price increase of $26m after taking into account price increases and decreases arising from the 22 disputed items. Two of the 22 disputed items related to impairment of loans, together these two items accounted for a $156.6m price decrease. Final acquisition payment, $26m paid to HBOS. Commonwealth Bank year-end financial statements released, including details of the Bankwest acquisition. Project Magellan commenced by the Commonwealth Bank to evaluate the adequacy of loan impairments for 1100 higher risk non-retail Bankwest customer files including targeting property finance, aged care and hotel sectors, covering security valuations greater than $5m or greater than two years old. Sources for the information in the timeline include the #ACCC Public Competition Assessment, the * Commonwealth Bank answers to questions on notice, @the dispute notice, % Commonwealth Bank response to submission 109 by Mr Trevor Hall. allegations about capital holding requirements under prudential standards. 7.14 The Commonwealth Bank's response to each allegation is also discussed. In examining the Bankwest issue, some individuals put forward the terms of the purchase agreement entered into by the CBA to acquire Bankwest as an explanation for what occurred. The committee notes these concerns but believes other factors such as the deterioration of the property market and general anxiety about the business and economic environment seem more significant based on the evidence available. 7.16 Several submitters and witnesses have suggested to the committee that new evidence has become available to shed further light on the allegations regarding the initial purchase price for Bankwest, the price adjustment mechanism and the warranty and excess loan amounts. These allegations and the responses received from the Commonwealth Bank are set out in the following sections. The actual purchase price agreed with HBOS can also be verified from the 8 October Investor pack, where...the CBA states that the purchase price is 0.8 times the 2007A book value. The 2007A book value is verified in the Investor Pack as being for $3,050 million. Thus, 0.8 purchase price multiplied by $3,050 book value equals $2,440 million. This amount bears close similarity to the theoretical estimate of the agreed purchase price for Bank[w]est, as at 8 October 2008. ...the agreed purchase consideration was... actually $2.428 billion. The bank handed over $2.1 billion and they withheld $328 million. They then conducted this review and...increased the losses and backdated the provisions. They increased the losses so much that the price of the bank reduced, so they did not have to pay $328 million; they only had to pay a final additional payment of $26 million—a clawback saving of $302 million. [The allegations fail] to note that Commonwealth Bank’s Investor Presentation dated 8 October 2008 stated that book value is defined as ordinary shareholders’ equity, which excludes redeemable preference shares issued by Bankwest. As shown below the initial purchase price is $2,100 million as Commonwealth Bank has consistently stated, not $2,440 million. The sum of $328 million in the Profit Announcement for the half year ended 31 December 2008 represented an initial estimate of the outcome of the price adjustment mechanism contained in the Share Sale Deed for the acquisition of Bankwest. An estimate was included as the Profit Announcement was finalised before the release of the draft completion balance sheet from HBOS. From 8 October 2008, the CBA began with the construction of a process to impair and provision the Bankwest Commercial Loan Book, utilising the BankWest purchase price and outstanding wholesale funding amounts in an attempt to effect (but not openly), its plan to reduce the Final Purchase Price paid for BankWest. claw back, and / or offset from the loan outstanding to HBOS, all amounts of provisioned and impaired debts up-­‐to the entire amount of the Initial Purchase Price. The central allegation of the CBA/Bankwest unconscionable conduct is that CBA had a financial motive to force Bankwest commercial loan customers into insolvency in order to obtain a discount on the purchase price from HBOS by way of an impairment indemnity - referred to as “clawback”. These losses could be incurred firstly, prior to the purchase on 19th Dec 2008 or secondly, retrospectively after the purchase as long as the impairment date was successful backdated to 19th Dec 2008. Having read the contract of sale between the CBA and HBOS Australia it would appear that there were two (2) opportunities for the CBA to reduce the purchase price. The first opportunity was referred to as the Adjustment to the Purchase Price, in clause 10 of the Share Sale Deed. The Second opportunity was the warranty provisions of the Share Sale Deed under clause 15 Warranties and clause 16 Limitations of Liability. However, [the] 20 April 2009...“Sale Deed--‐Draft Completion Balance Sheet Dispute Notice”...references Clause 10 of the Share Sale Deed. Page six...refers to the adjusted purchase price calculated by HBOS Australia reflecting the trading results up to 18 December 2008. Based upon these results HBOS Australia had requested an increase in the purchase price from $2,100 million to $2,296.8 million being an increase of $196.8m. The CBA claimed a reduction to this increased price in the amount of $490.8m. The majority of this claim for a reduction in price was based upon provisions made against customer loans for anticipated losses that were identified by the CBA within the first 40 working days following settlement. Upon release of the draft completion balance sheet, the estimate of $328 million was revised downwards to $196.8 million. This was further revised to $26.1 million upon the Independent Expert’s determination under the price adjustment mechanism, resulting in a final purchase price of $2,126.1 million. Contrary to [the] submission, the estimated balance of the purchase price ($328 million) was not reduced through Commonwealth Bank manipulating the level of impaired loans. The estimate was firstly reduced through HBOS’ Draft Completion Balance Sheet delivered on 19 February 2009 and then through the price adjustment mechanism determination of the Independent Expert. Both these processes occurred in accordance with the provisions of the Share Sale Deed. $186m for group collective provisions and impairment losses on loans and advances. The Independent Expert determined that Bankwest’s individually assessed provision on specific disputed loans should be increased by $106.5 million and Bankwest’s collective provision should be increased by $50.0 million, equating to $156.5 million before tax and capital impacts to reflect the need for higher loan impairment provisions as at 19 December 2008. No further adjustments could be made to the final purchase price, once it was determined by the Independent Expert. PwC in its role as external auditor performed procedures in relation to the final purchase price and identified no errors. In addition, PwC states it was not aware of any other agreement relevant to determining the purchase price of the acquisition. 7.26 The Commonwealth Bank informed the committee that there were no other periods for review or reassessment of loans or price adjustments that occurred in addition to the loans considered in the July 2009 expert determination. The Commonwealth Bank also confirmed that there were no other agreements entered into between the Commonwealth Bank and HBOS that varied the purchase price subsequent to the Independent Expert’s determination. The Commonwealth Bank also informed the committee that its lawyers Herbert Smith Freehills and auditors PwC have also confirmed that they are not aware of any other agreement relevant to determining the purchase price of the acquisition. ...the CBA did not pay the entire [$17 billion] amount of wholesale funding to HBOS on acquisition. The $4.6 billion loan amount that the CBA has not paid back to HBOS for the purchase, meant that they were not required to fund the entire purchase price in the market because they had obtained $4.6 billion of it by way of vendor finance. Clause 12. (c) of the Share Sale Deed limited the CBA’s obligations for payments of Bank[w]est’s indebtedness to the HBOS companies to $14.5 billion with the remainder, the “Excess Amount”, payable in 6 months from that date. A central proposition in the submission...is that HBOS subsidised Commonwealth Bank’s acquisition of Bankwest to the amount of $4,587 million through the “Excess Amount”. The Excess Amount due to HBOS as at 31 December 2008 was $744 million. “Payables due to financial institutions” included this Excess Amount ($744m), a loan from the Reserve Bank of Australia ($3,751 million) and other miscellaneous payables ($92 million). By 19 December 2008, Bankwest had borrowed $3,751 million from the Reserve Bank of Australia (RBA) (excluding interest) and used these funds to repay a portion of its intragroup funding with HBOS prior to completion. Bankwest repaid the RBA funding amount in January 2009 and increased its funding from Commonwealth Bank. The excess funding amount between HBOS and Bankwest was determined to be $744 million. In accordance with the Share Sale Deed, $744 million was settled with HBOS on 19 June 2009. No further payments were made to HBOS in relation to funding commitments. The net effect of these clauses are that under the Warranty provisions of the Share Sale Deed...the CBA was able to claim from HBOS for impaired assets not provided for by HBOS in the Draft Audited Finalisation Accounts...By this I mean provided that the CBA made a claim for an impaired asset within 20 days of its knowledge of an impairment and 12 months of the completion of the purchase of the Bankwest Shares the CBA had an unlimited amount of time in which spread out the foreclosures over the following years. It is possible that after a certain amount of individual claims CBA would effectively buy Bankwest for nothing. It is contended that it was for this motivation that the CBA continued with its aggressive foreclosures on the Bank[w]est Commercial loan book well beyond the conclusion of the price adjustment mechanism adjudicated by Ernst & Young in July 2009. Subsequent to the impairment and provisioning of loans that were stated on the dispute notice, you identify them on the basis that in the 12 months that followed from 19 December 08 to 19 December 09, a great number of loans were provisioned and impaired, and a warranty claim was clearly made on the seller's guarantor. The seller's guarantor was HBOS plc, which was the parent company. The parent company of HBOS Australia being HBOS plc. (UK) provided a warranty to the CBA. This warranty was limited in value to the initial purchase price, as defined in the Share Sale Deed as $2.1 billion. The warranty was limited to matters that became known to the CBA after the sale. The warranty was limited to a period of one (1) year after the sale. Alternatively did the CBA rely on the warranty provisions in Share Sale Deed to create a second “claw back” event based upon the impairment of commercial loans during the warranty period? They had 18 months which, we assume, was their negotiated warranty period during which they could make HBOS pay for it. It is a strange thing that, if you do the maths, it hits the wall at 18 months—which is the end of the warranty period, or the amended warranty period—and then they turn into a good bank. HBOS exposures such as letters of credit and bank guarantees. In respect of these three matters, Commonwealth Bank, HBOS plc and Lloyds International Pty Ltd (formerly HBOS Australia Pty Ltd) entered a commercial settlement on 11 December 2009. Commonwealth Bank received a payment of A$5,360,193 on 15 December 2009 under the settlement. The parties also released each other from claims under the Share Sale Deed, including any warranty claims other than warranties relating to ownership and structure of the Bankwest Group and warranties relating to tax matters. Commonwealth Bank has not made any claims under these warranties. a records deed to transfer records. At the time that the CBA entered into the Bank[w]est Share Sale Deed, it had formed the view that it would not be proceeding with a large part of the Bank[w]est Commercial Loan Book, and that it would exact the cost of its exit from that loan book at the cost of HBOS. It would do so by making provisions against the loan book, and by impairing and provisioning the Bank[w]est Commercial Loan Book Customers facilities. This process of intentional reclassification meant that, in aggregate, there were at least 1,100 performing loans provisioned and impaired from the commercial loan book and placed into receivership. These loans included loans otherwise appearing on the Bank[w]est good loan book. Hundreds of Bankwest commercial loan customers were foreclosed upon by the CBA in the period from late 2009 through to (as late as) 2013, well after the sale settlement in July 2009. CBA would have the Senate believe that this was merely as a result of a ‘book review’ (known as Project Magellan) and that CBA had no clawback-type motive to wrongly force these customers into default. Source: Commonwealth Bank, Answers to questions on notice, taken on 1 December 2015, received on 24 December 2015. At the time of the purchase, Bankwest was a Basel I accredited bank, and Commonwealth Bank was the first bank to move to Basel II advanced accreditation. So they had different capital profiles...Commonwealth Bank were having difficulty raising capital during this period, so the solution was to reduce the amount of customers that they had on the books. ...Bankwest was subject to the Bankwest act, which stopped Bankwest from being moved up to the Basel II advanced accreditation. That could not be moved up in line with Commonwealth Bank, which created a discrepancy of capital profile between the two banks. The resolution of that was that they could not raise the capital; therefore, they terminated the customers. We have just had the financial services inquiry, where the regional banks have put up their submissions, saying their cost of capital is three times that of first tier banks like the CBA, and you can imagine a Bankwest having a heavier loading of commercial loans and maybe having four or five times the cost of capital because of the APRA requirements. The CBA immediately in 2009, if you read their financial statements, tried to get advanced accreditation for Bankwest so they could reduce its cost of capital. What was in the way was that commercial loan book. The Bank of Western Australia Act contains no provision which refers to prudential regulation, regulatory capital nor Basel framework accreditation – certainly nothing to stop Bankwest from applying to become Basel II advanced accredited or raising capital. The differing Basel regulatory capital treatments had no impact on the management of individual customer accounts. There is no economic incentive for the Group to recognise losses on Bankwest loans under either the Basel I or Basel II capital regulations. Actually recognising losses means a permanent loss of capital for the bank. I have provided a folder of approximately 100 personal impact statements from victims of 'Project Magellan' This code name was created by the CBA to describe 'a review of our portfolio' that resulted in the mass impairments of Bankwest commercial clients following the purchase of Bankwest by the CBA. It is difficult to believe that this mass impairment was actually given a code name but it is true. A further provisioning review ensued. This was code--‐named “Project Magellan”. During Project Magellan, BankWest instructed valuers to revalue customer’s loan security on a ‘worst--‐ case scenario’ to potentially trigger an LVR default. As a result of Project Magellan, BankWest both provisioned and impaired, and appointed Insolvency Practitioners to its customers loans in the FY10 period to approximately 332 Performing Loans. This represented a combined loan value of approximately $2.65 billion. As unexpected losses continued to emerge from the Bankwest commercial loan portfolio, it was decided that a thorough review needed to be undertaken of loans, including ensuring that current independent valuations were obtained to reflect the deteriorating property market. This was conducted as part of Project Magellan, which commenced in April 2010 and resulted in a significant increase in loan impairment expense. The purpose of Project Magellan was to evaluate the adequacy of loan impairment expense for accounting purposes. We commissioned an exercise to look at 47 per cent, by dollar value, of all of the commercial books in Bankwest: We looked at 1,200 files to make sure that they were properly classified and in order, basically. As a result of that exercise, we set aside further collective and specific provisions on accounts. That was an exercise to make sure, once and for all, we had the correct provision. 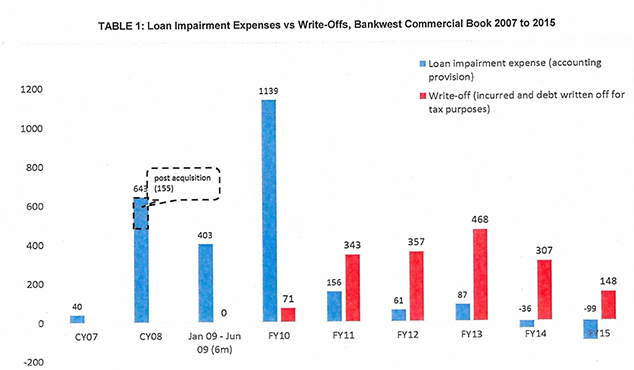 7.46 The Commonwealth provide further information in Figure 7.1 on the level of Bankwest accounting provisions for impaired loans and subsequent write-offs over several years. Figure 7.1 shows the increase and decrease in impairments and write-offs and indicates that there is a significant time lag between when a loan book has a significant number of impairments and when write-offs subsequently occur. Source: Commonwealth Bank, Tabled document, 2 December 2015. Although ASIC has only received around 60 reports of misconduct about this issue, what we have observed is that there is a variety of borrowers in different circumstances. Some borrowers had loan facilities that were not renewed by the Commonwealth Bank. The Commonwealth Bank was in a position to decide not to renew loan facilities, even though perhaps those loan facilities had been renewed previously. In other circumstances the borrowers had missed repayments and, therefore, the Commonwealth Bank was simply exercising the rights that it has under the contract to enforce those contracts. 7.48 The previous section discussed allegations put to the committee that there was a deliberate strategy by the Commonwealth Bank to over-impair loans in order to seek financial gain through a range of mechanisms. After considering the evidence and responses it has received, the committee notes that despite the significant spike in loan impairments, it has not been able to determine that the impairment of loans was soley motivated by clawbacks or warranties. While the contractual arrangements associated with the acquisition of Bankwest may have played a role, the evidence before the committee points strongly to a culture of placing profit and return to shareholders ahead of the interests of borrowers. 7.49 The above allegations relate to whether there was a strategic, management driven motive to impair loans to access clawbacks or warranties. The committee notes an alternative possibility that the problems were caused in part by motivations of bank officers driven by remuneration incentives that cause them to be over optimistic when initiating loans. Senior management in banks are responsible and should be held accountable for the conduct of bank staff and their treatment of borrowers. 7.50 Motivation aside, the committee does however, remain concerned about that the way these matters were handled which reinforces the need for the recommendations that have been made in preceding chapters of this report. 7.51 The committee notes that the price adjustment mechanism created a potential incentive for Bankwest, when owned by HBOS, to under-impair loans, to make the loan book look better. This would have strengthened their claim for an increase in the Bankwest sale price. As no allegations about this have been put to the committee, the issue is simply noted here for completeness. 7.52 In proceeding with the price adjustment mechanism, both HBOS and the Commonwealth Bank engaged the services of major accounting firms, KPMG and PWC respectively, to conduct assessments of the levels of impairment of the Bankwest loan book. The arbitration of provisions for impaired loans (also presumably based on the same accounting standards) was carried out by Ernst & Young as the independent expert. The fact that the three assessments differed by hundreds of millions of dollars would suggest that despite the same accounting and prudential standards being used, identifying which loans were impaired and the extent of the impairment was an uncertain process requiring commercial judgements in a significant number of cases. 7.53 Even if there was no deliberate strategy by either HBOS or the Commonwealth Bank to under or over-impair loans, the practical outcome was that a group of up to 67 loans were likely to have been in financial difficulty, yet the technical decision on whether they were impaired may have been left undetermined for many months throughout the sale negotiations and price adjustment process. For the affected businesses, that elapsed time without action to address financial difficulties possibly compounded their problem. 7.54 The above uncertainty on the level of loan impairments demonstrates and quantifies the level of discretion that banks have in impairing loans. Such a broad discretion must be subject to appropriate monitoring and accountability. There are many loans for which the accountability is limited due to the lack of an applicable dispute resolution scheme. A discussed in chapters 2, 3 and 4 the committee is therefore recommending substantial improvements to dispute resolution schemes, codes of practice and the regulation and monitoring of lending. 7.55 This section summarises allegations put to the committee regarding ANZ's acquisition of the Landmark loan book and ANZ's response to those allegations. 7.56 Landmark is a diversified rural merchandise business which, at the time it was acquired by ANZ, was a division of the Australian Wheat Board. Landmark Financial Services (LFS) was a division of Landmark that, at the time of its acquisition by ANZ, provided agribusiness lending of about $2.4 billion, had debenture (akin to deposit) accounts of about $300 million and had about 10,000 customers. ANZ decided to purchase the book debts of the AWB in these various farming arrangements for about 16 per cent of the total value of the capital of farms and securities to which they referred. From a banking point of view it was a pretty good deal. The difficulty then began for many farming families, because they were resumed by enforcing security arrangements entered into nominally with Landmark in some cases up to 22 years but then reduced to periods of two months or five months, placing farmers in an impossible situation commercially. Just imagine, if you had a 22-year loan as a small business, which is what a farm is but with particular special circumstances, namely the prospect of unanticipated drought, floods, market. ...why would ANZ want to buy the Landmark loan book in March 2010, knowing that its customers were farmers, and then make representation to those customers that ANZ was an agribusiness specialist to induce them to sign a contract but then systemically put a considerable section of those customers and their valuable viable businesses into forced liquidation almost immediately after signing over? ...in the case of ANZ it looks as though they had become a very significant securitised lender...it appears as if ANZ decided—its AWB loan position was at risk—to emerge from the shadows, take front-line positions in relation to lending operations to farmers direct, not through the AWB or through Landmark. As a result, it was able to renegotiate terms of credit. We reiterate that ANZ aims to work with commercial customers in default to help them get back on track. Less than 0.1 per cent of all commercial customers are subject to ANZ enforced insolvency action. It has been alleged that ANZ enforcement action has been taken at short notice, but we are unaware of any case where this is correct. Details of a number of customer matters have been provided on a confidential basis to the Committee. These show that enforcement action is only taken after negotiations with customers or attempts to negotiate with customers over a period of time. Claims that ANZ truncated long term loans to periods of two to six months are incorrect. Customers in default are given time to sell down assets to get back on track. It would appear that a six month deadline given to sell an asset has been mistakenly construed as a truncated loan period. Impairment without contractual default may occur where an assessment is made, for example, that a business is in decline and although the customer has not defaulted, ANZ has formed a view that a loss will ultimately result. ANZ was a financier to the Australian Wheat Board (AWB), but did not have a relationship with Landmark prior to the acquisition. ANZ and Rabobank provided wholesale funding for the AWB/Landmark loan book under a securitisation trust structure in which Permanent Custodians Limited (PCL) acted as the trustee. ANZ’s component of the wholesale funding was around $1.1 billion. AWB and Landmark were the administrator/servicer under the trust, which meant they were responsible for the day to day dealings with customers. Whilst customers dealt with Landmark, their loan was legally offered by and owed to PCL. ANZ rejects Peter King’s evidence at the 16 February hearing that the decision to purchase LFS was as a result of ANZ’s exposure as a securitisation lender to the AWB. ANZ’s lending under the securitisation funding was not a factor that influenced the transaction. I would like to acknowledge, having reviewed many of the 123 submissions to the inquiry—and, in more detail, the 11 related to ANZ customers, of which five are related to Landmark—that there are some cases where we should have done a better job of working with our customers. As well, there have been examples where we could have done a better job of ensuring that those who act as our agents or who are appointed by us—lawyers, receivers or others—behave in a way that is acceptable to the bank and to our customers. It is clear to me that, for some Landmark customers, we should have done more to explain what ANZ's acquisition of the loan portfolio meant to them...Most disappointing to me are the individual cases where we did not meet the standards of customer support that I would expect of our bank. Our experience of the Landmark acquisition has led us to review our practices and introduce some new measures at ANZ...The staff have greater flexibility to help good farmers manage their way through tough times. 7.64 The committee considered allegations regarding deliberate impairments or defaults of performing loans associated with ANZ's acquisition of Landmark. After considering the evidence and responses it has received, the committee has not been able to conclusively determine that this occurred. As with the Bankwest evidence, motivation aside, the committee is concerned at the way many of these matters were handled and that the extant system of checks and balances appears incapable of providing protection or redress to small business customers. The committee welcomes ANZ's acknowledgement that its treatment of customers could be improved and that it is now implementing better practices. The committee will follow with interest developments in ANZ's approach to resolving issues with customers and encourages all lenders to take an open and constructive approach to helping borrowers resolve their difficulties, especially in light of the significant power imbalance that may exist between lenders and borrowers. That funding be provided to ASBFEO¾acting as a tribunal¾to consider legacy cases in the event that lenders do not choose to examine contentious cases as suggested above. that funding through a user pays industry funding model be provided to Australian Small Business and Family Enterprise Ombudsman ¾acting as a tribunal¾to consider cases retrospectively in the event that lenders do not choose to voluntarily examine contentious cases as recommended above.